Tata officially revealed Buzzard at the 2019 Geneva Motor Show along with three new products, which will be introduced in our market. The Buzzard is the 7-seater version of Harrier, which is codenamed as H7X and it is going to be launched in a different name this year. The upcoming 7-seater SUV is based on the D8 platform of Land Rover Discovery Sport and it is likely to be positioned in the same price bracket as Toyota Innova Crysta. The Innova Crysta is 74 mm longer than Buzzard but the latter is 64 mm wider. The height and wheelbase of both models are almost the same but the Innova Crysta is slightly ahead in both. We can expect space inside the cabin for both models almost the same but the additional length might give a small advantage for Innova Crysta in the boot space. Tata Buzzard is based on the Impact Design 2.0, which made its debut in Harrier. 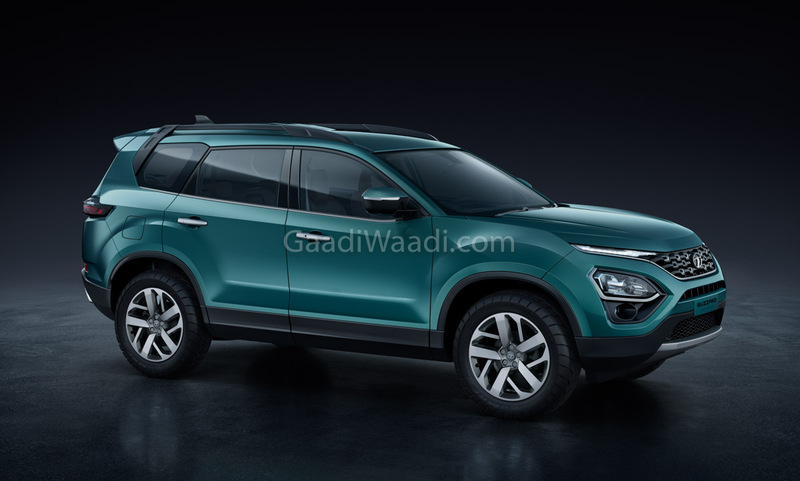 The front design is exactly similar to Harrier as the new model retains the split headlamps set up with LED DRLs on top and projector headlamps below. The difference is in the side as the company increased the length to accommodate the third row. The company has redesigned the roof along with minor changes for the rear three quarters. The rear gets the same LED tail lamps and bumper from Harrier. Overall, the design theme and dimensions give a big look for the Buzzard. The Innova Crysta is one of the most popular models in its segment and the company has given premium design theme for the MPV. 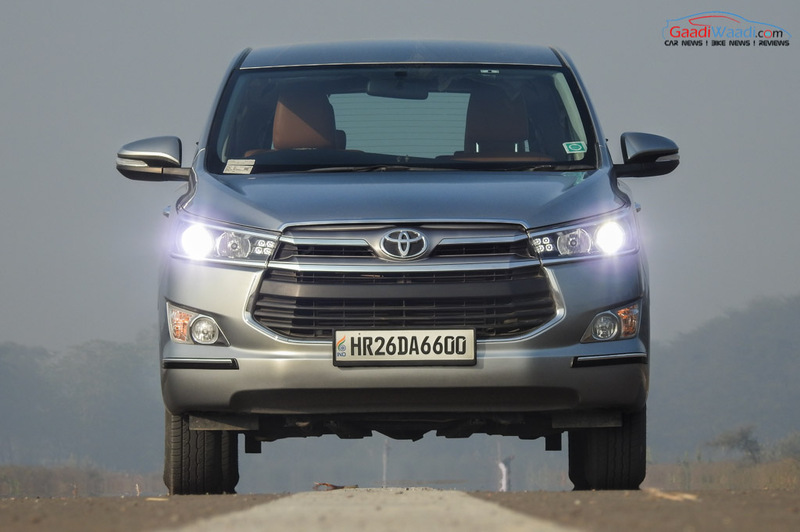 The front gets new grille with swept back projector headlamps with LED DRLs. The side design is simple and the company has given alloy wheels. The rear get LED tail lamps and a chrome line between them. Even though the current model was introduced a couple of years back, it doesn’t look old and the design has aged well. Tata Buzzard shares the same interior design theme with Harrier, which is not a bad thing as the company has given a premium design for the Harrier. The wood finish in dashboard along with high-quality materials improves the appeal of Buzzard. The instrument cluster of Buzzard is dominated by a big MID display and the only thing analogue is speedometer. The Buzzard also comes with lots of features. 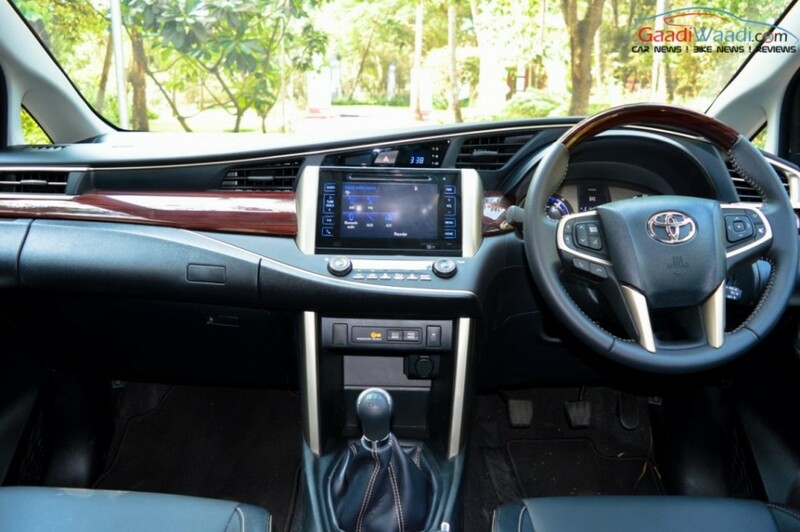 Toyota Innova Crysta interior also gets a modern design and the quality of materials is really good. The metallic finish for the centre console along with wood inserts on the dashboard goes well with the overall design. The steering wheel is a four-spoke unit and the metre console gets a conventional design. Overall, the modern and premium design theme of Buzzard will appeal more to customers when compared to Innova Crysta. 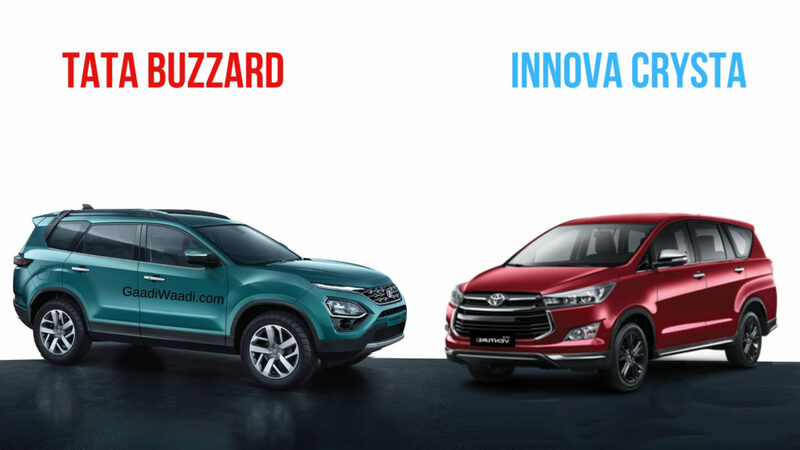 Both models are loaded with lots of features like touch screen infotainment system, climate control, projector headlamps, LED tail lamps, alloy wheels, automatic headlamps, reverse camera with parking sensors, rain sensing wipers, dual airbags standard (6 on Buzzard and 7 on Innova Crysta), ABS with EBD, traction control, Electronic Stability Program and more. 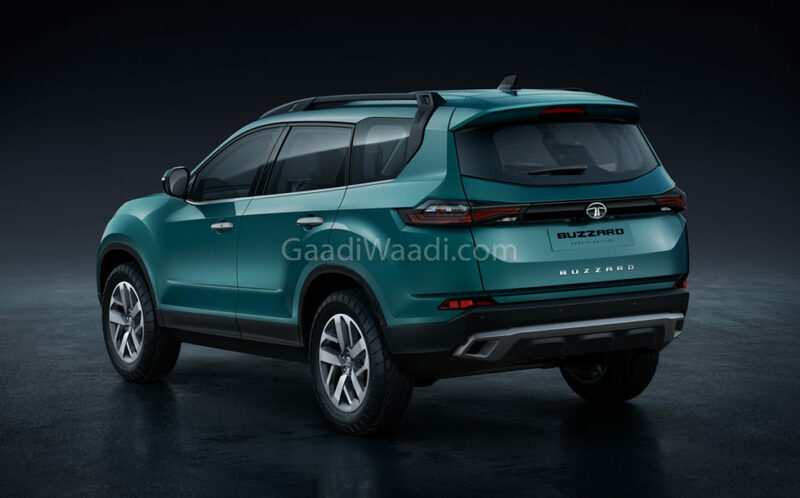 But the infotainment system on Buzzard offers both Android Auto and Apple CarPlay connectivity options and the 9-speaker JBL audio system will be much better than the stock unit of Innova Crysta. We are also expecting Tata Motors to offer features like a sunroof, electric adjust for driver seat, wireless charging, ambient lighting and more when compared to Harrier. Tata Motors is expected to offer both diesel and petrol engines with Buzzard. But the company hasn’t revealed details about the petrol engine and the diesel engine is going to be the 2.0 L unit sourced from FCA producing 172 PS of power and 350 Nm of torque. This engine will be mated to a 6-speed manual and 6-speed automatic transmission sourced from Hyundai. 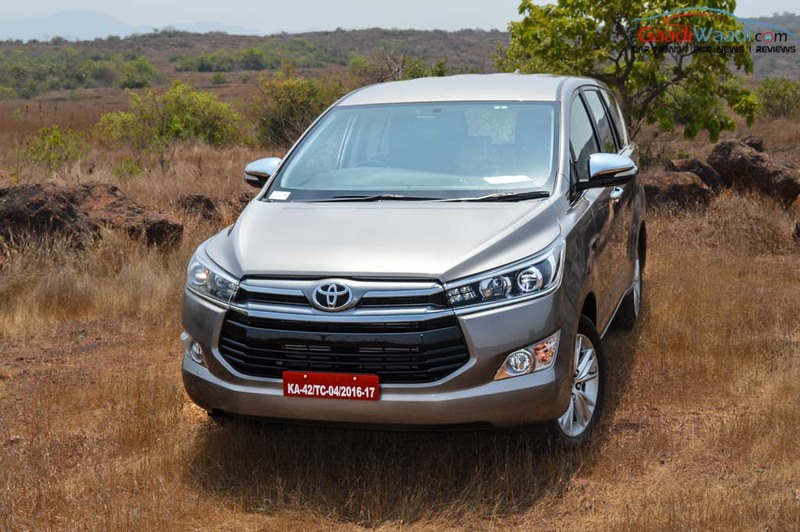 The Innova Crysta is available with two diesel engine options – 2.4 L and 2.8 L. The entry-level 2.4 L diesel engine produces 150 PS of power at 3,400 rpm and 343 Nm between 1,400 rpm and 2,800 rpm. The 2.8 L engine puts out 174 PS at 3,400 rpm and 360 Nm at 1,200 rpm – 3,400 rpm. The 2.4 L engine is mated to a 5-speed manual and 2.8 L to a 6-speed automatic. Just comparing the diesel engines, the Innova Crysta is more powerful and torquier by a little margin.